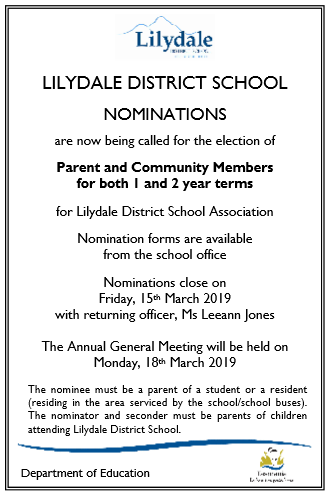 Lilydale District School is situated 30 kilometers from the center of Launceston and has an enrolment of over 360 students, from Kindergarten to Year 12. The families of our students are involved in diverse occupations which include agriculture, forestry, the arts and service industries both in and around the Lilydale District and Launceston. Each has a Sector Leader who is a member of the Leadership Team. All classes are composite with the exception of Years 9 and 10. Primary students access our specialist secondary facilities: mini-modules, for subjects like Food Studies, Art, Drama, Music and Applied Technology and Design (ATD). All secondary students select optional subjects in addition to their core subjects. The school is very well provisioned with ICT resources, including interactive whiteboards and wireless netbooks. Students K-6 utilise networked, classroom based, computers, and regularly access the school’s computer lab. Community partnerships are actively sought by the school to support extensive learning opportunities for our students and also to play our part in supporting our community.